Germany. 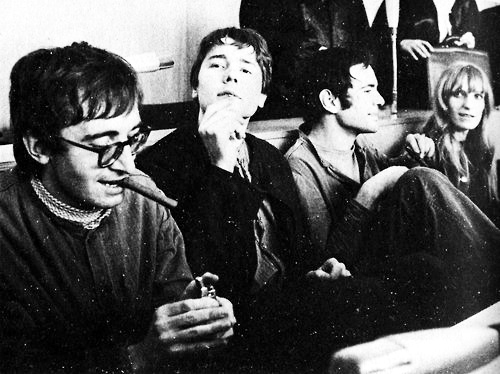 By the end of the 1960s, the American and British counterculture and hippie movement had moved rock towards psychedelia, progressive rock and other styles that incorporated socially and politically incisive lyrics, 1968 German, French, Italian students had created a class of young, intellectual continental listeners. Avant-garde music had taken a turn towards the electronic in the mid-1950s, the minimalistic music current which emerged in the beginning of the 1960s with the works of La Monte Young and Steve Reich using drones and loops (often with synthesizers and tapes) in a kind of psychedelic, space-oriented music. 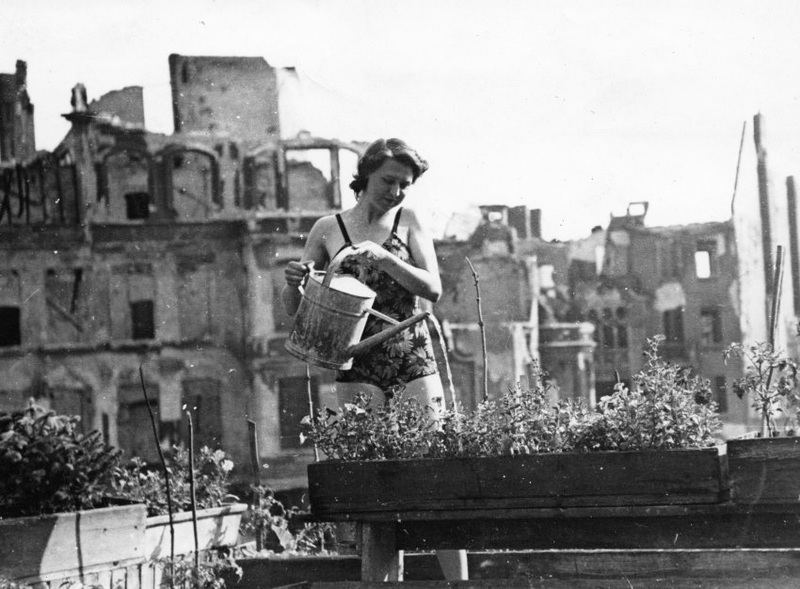 These factors, plus the Social Market Economy (Wirtschaftswunder) and Marshall Plan, reedified the country in less than 10 years after WWII, laying the scene for the explosion in what came to be termed Krautrock, which arose in a rock festival in 1968 in Essen. Like their counterparts, German rock musicians played a kind of psychedelic music, however, there was no attempt to reproduce the effects of drugs, but rather an innovative fusion of jazz, free-jazz and the electronic avant-garde. That same year, 1968, saw the foundation of the Zodiak Free Arts Lab in Berlin by Hans-Joachim Roedelius and Conrad Schnitzler, which further popularized the psychedelic-rock sound in the German mainstream. The next few years saw a wave of pioneering groups. 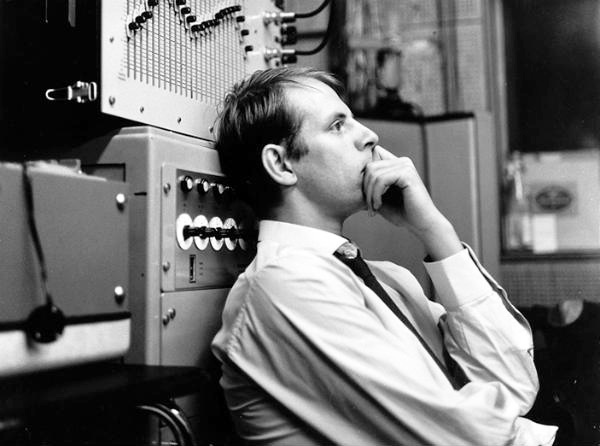 In 1968, Can formed by two former students of Karlheinz Stockhausen, adding jazz to the mix, while the following year saw Kluster (later Cluster) begin recording keyboard-based electronic instrumental music with an emphasis on static drones. In 1970, Popol Vuh became the first group to use an electronic synthesizer, to create Kosmische Musik. By 1971, Tangerine Dream and Faust began to use electronic synthesizers and advanced production. Other bands like Ash Ra Tempel and Cosmic Jokers also made use of synthesizers and tape manipulation in a way foreshadowing the noise rock. In 1972, two albums incorporated European rock and electronic psychedelia with Asian sounds: Popol Vuh’s In Den Gärten Pharaos and Deuter’s Aum, meanwhile, a band called Neu! began to play highly rhythmic music. 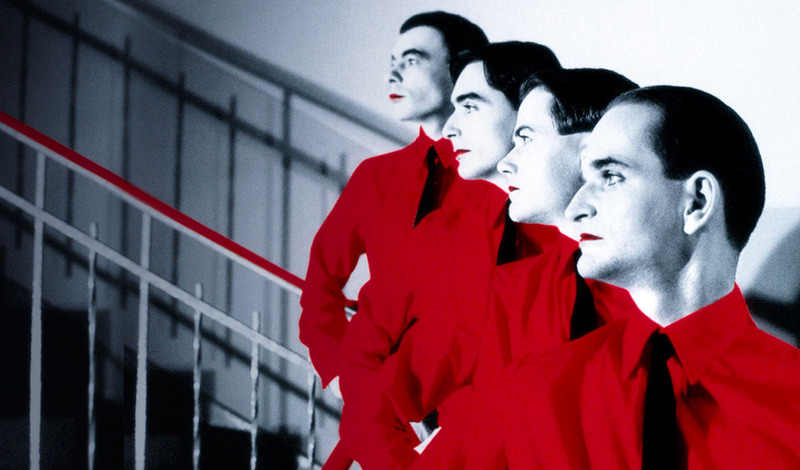 By the middle of the decade, one of the best-known German bands, Kraftwerk, had released albums like Autobahn and Radioaktivität, which laid the foundation for the British 1980s synth pop, new-wave, electro, techno and other styles later in the century! By the mid-late 1970s onward the terms electronic rock, electronic music and new age have been used more often than Krautrock and Kosmische Musik, though the early scene continues still today to be regarded as a style in and of itself. 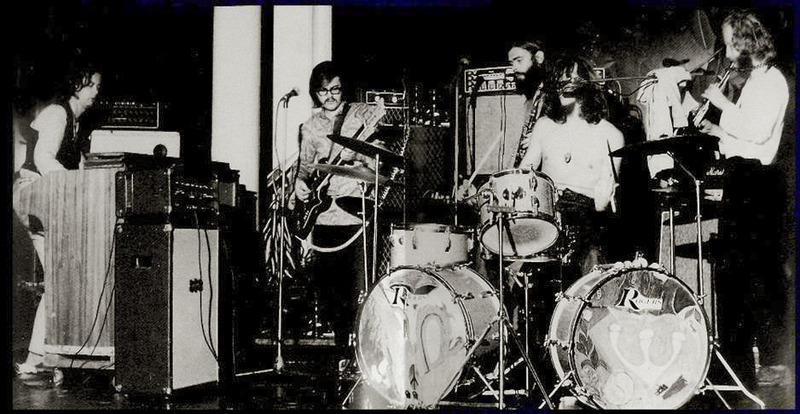 The short-lived Xhol Caravan was one of the earliest Krautrock groups, and their unique fusion of jazz and rock was a precursor to the direction that Embryo, Out of Focus, Thirst Moon, Ikarus, Kraan and countless other German groups would take in the 70’s. 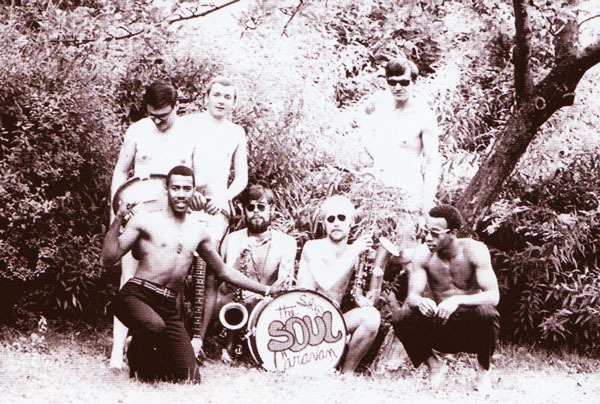 Formed by saxophonists Tim Belbe and Hansi Fischer, the group started out in 1967 under the name Soul Caravan. With a Motown-influenced bassist as well as two African-American vocalists, James Rhodes and Ronny Swinton, the group made competent but conventional R&B and soul music, that same year they released the record Get in High on CBS with little repercussion. By 1968, after several lineup changes, their sound began to develop into a more distinct blend of psychedelic, progressive rock and free jazz, with a wide range of influences, including The Soft Machine, Pink Floyd, Jimi Hendrix and Frank Zappa. Eventually the group coalesced with Belbe, Fischer, Rhodes, Klaus Briest, Skip Vanwych, and Ocki Brevert. 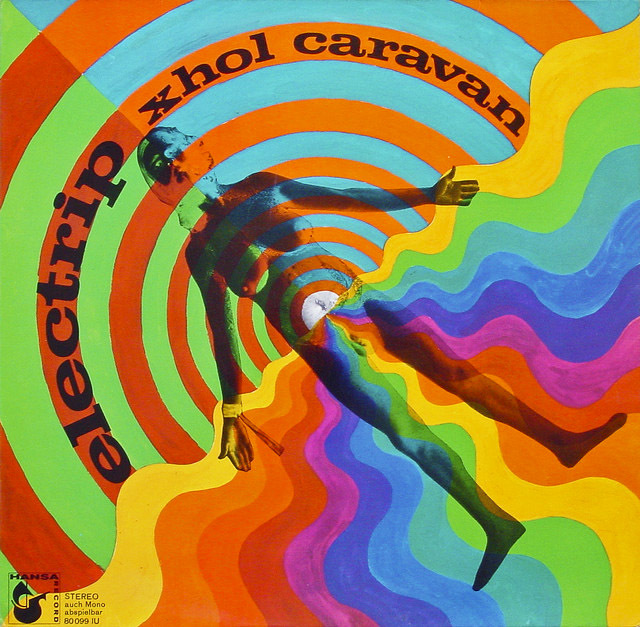 In early 1969 they changed their name to Xhol Caravan to release a single Planet Earth / So Down on the Hansa label and later that year, they released the strange and excellent Lp Electrip, also on Hansa. 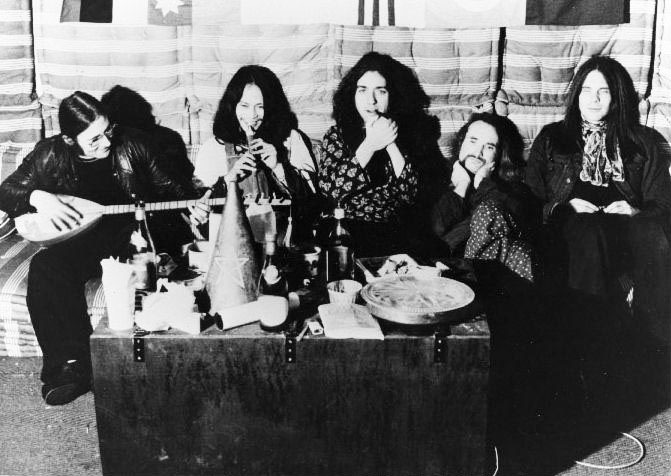 They were a popular group at the time, constantly gigging and playing festivals, and even appeared live on WDR Radio that year as well as on television with Zappa, Tangerine Dream and Amon Düül II (the legendary band). Fischer left the group before the end of the year, and the band eventually shortened their name to Xhol to avoid confusion with the British group Caravan. More studio and live material was recorded that year, though the group was unable to release any of it until they signed on with Ohr Records. In 1971 Ohr released Hau-Ruck, the following year, Motherfuckers GMBH & Co KG came out, with both live and studio tracks (recorded in 1970). Xhol disbanded at about this time. Today’s album is shaped more by the precedence than by personal preference! Still in 1969 only them and Amon Düül II had released an album, the instant classic Phallus Dei (a dedicated post will appear). Both the bands were the vanguard for rock music in Germany and dictated the paths for many other acts.Already considered the Germany’s answer to Soft Machine (i don’t like this comparison), the overall here is improvisational jamming with the composed sections not so developed. This is definitely worth a listen for anybody interested in the early years of the Jazz-Rock movement, the electric flutes and saxes will please you as the druggy atmosphere. The only 5 songs release is once again most important as a whole than any selected piece, therefore enjoy the first steps of a multi-layered electronic genre that will often shown up here, stay tuned and… Gute Fahrt!